Using live storytelling and an open world, Illfonic plans to revive the MMO. The MMO seems to be a genre wreathed in nostalgia. Perhaps it's the post-WoW shift to mainstreaming gameplay or simply a longing to relive that first experience players had in these virtual worlds. Regardless, developers IllFonic want to breath new life into the genre with Revival, and non-linear MMO that builds its world with live storytelling events and lots of player freedom. "The genre has been locked out with a bad taste for a decade," IllFonic told Shogun Gamer. "It's time to rethink it, go back to the drawing board, start from scratch and tell everyone that an MMO isn't a stat-chasing, quest-ignoring snorefest." To do so, it's creating a story-driven world, not by relying on static questlines, but by having GM's play a larger role in the world. "The live storytelling aspect is like playing Skyrim, but imagine someone is playing as the dungeon master, opening and closing things all over the place," IllFonic's Gonzalez told Massively. "The game is 100% non-linear, so there are no useless quests," Gonzalez continued. "You won't encounter something that's not really worth your time as a character. Sure, we may have some bland quests like the 'kill x for me please' quests, but that's filler, and it's good to have those. Most of our quests will have serious sit-down-and-think scenarios." 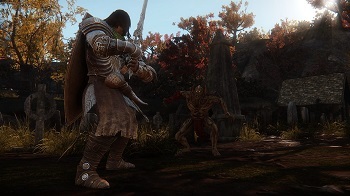 Revival will also have an open PvP system with full looting. To go along with that freedom, there will be a karma score. IllFonic wants to make it more than just a linear measurement of player-killing, but a spectrum. Even towns will have karma scores, each with their own benefits. IllFonic's plans for Revival sound pretty ambitious. However, it is admittedly still in the prototyping phase and many things might change in the meanwhile. It's currently being developed with CryTek's CryEngine 3 for the PC.